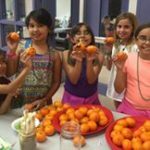 Kids in the Kitchen – Lawrence School | Junior League of Tucson, Inc. The Junior League of Tucson is focusing our volunteer efforts on preparing children and youth to be academically and socially ready for school. After rigorous research, three main impact areas have been identified; physical fitness and proper nutrition, social and emotional learning, and parent(s) and caregiver(s) involvement. The Community Impact Council will host events to engage our community with information and activities to help children and youth become ready for school through improving upon these three impact areas. On October 20, 2016, we held Kids in the Kitchen at Anna Lawrence Intermediate School with a goal of spreading awareness about the effect of nutrition and physical fitness on children’s ability to learn. Parents and their children rotated through stations including preparing a snack, where children learned how to prepare their own healthy snack, a dentist gave a presentation on proper dental hygiene, and a nutritionist shared information with parents and children about healthy foods and portion sizes. 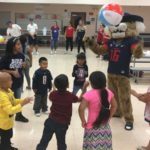 To the delight of many, Wilbur and Wilma Wildcat, mascots from The University of Arizona, played physical fitness games with the children. We provided resource materials for the families to take home including information where they can get affordable healthy food and attend free physical events within the community. “My committee worked so hard on each of their stations that they put together, it was truly a joy to see their work come to fruition through the smiles on the kids’ faces. The support we received from The University of Arizona was incredible and Wilbur and Wilma’s presence added an extra element to the kid’s evening. One child’s face, in particular, simply lit up when he saw Wilbur and he ran straight to him for a hug. The night showed me that something so simple as playing a game with child or giving them a new toothbrush made a difference to them, it made them feel special and valued. I’m so proud of the work my committee and the volunteers did because for one night, they made a child’s life just a little better.” – Hillary R.